After talking with a former colleague yesterday about the upcoming STAAR Writing test for Texas fourth graders, I decided to take this idea and put it in my Teachers Pay Teachers store. 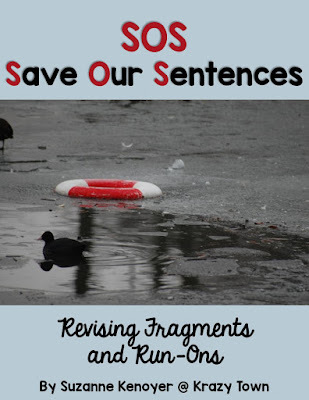 My students always struggled with the revision questions on the test, and it was because they had difficulty recognizing sentence fragments and run-on sentences. I came up with the idea of SOS. Students are given a set of three "sentences." They have to identify whether each one is a fragment, a run on, or a whole sentence. Then they have to fix the fragment, repair the run on, and spot the sentence. We did this every Friday for several months before the test, and my students aced the revising questions. An added bonus was that I saw a lot fewer fragments and run ons in their essays. Click on the picture above and it will take you to my TpT store.